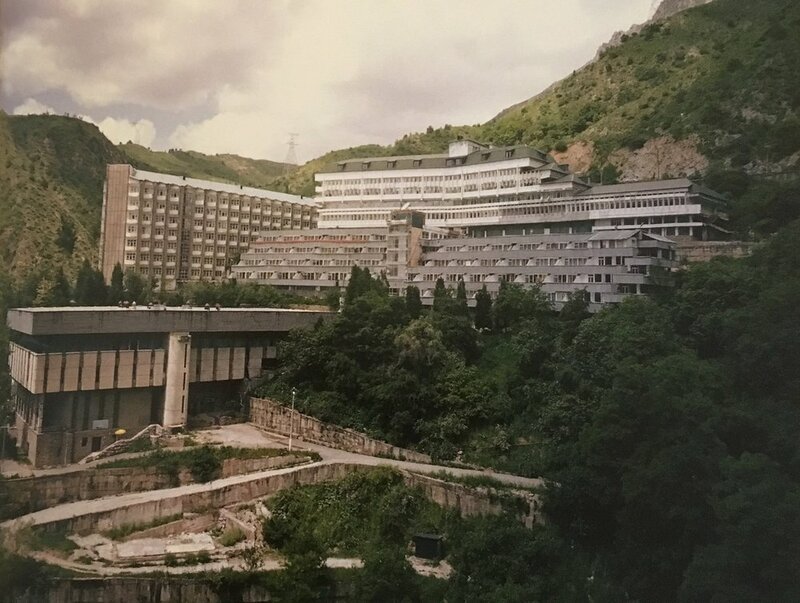 AT THE CENTER of the Venn Diagram of Brutalist architecture, spa culture, and Communist kitsch lies the Soviet sanatorium. In its heyday, the USSR had a network of hundreds of such centers across dozens of territories, from Estonia to Kazakhstan to the Russian Far East. Though their roots lie in the Russian tradition of curative baths, the sanatoriums of the 20th century shoehorned nicely into Soviet ideals of health and responsible rejuvenation, with workers encouraged to check themselves in yearly for a tune-up of their corporal machinery. Khoja Obi Garm, Tajikistan. Photo by Michal Solarski. Stavropol, Sochi, Russia. Photo by Egor Rogalev. Dnieper, Ukraine. Photo by Egor Rogalev. While ostensibly open to workers of all levels via a voucher system, the featured institutions more frequently served as the private retreats of the party elite: Kruschev frequented Abkhazia’s Amra International, Brezhnev was a regular guest of Matsesta in Sochi, and Stalin had his own private treatment room at Georgia’s Tskaltubo. Alyans, Russia. Photos by Dmitry Lookianov. Naftalan, Azerbaijan. Photos by Claudine Doury. 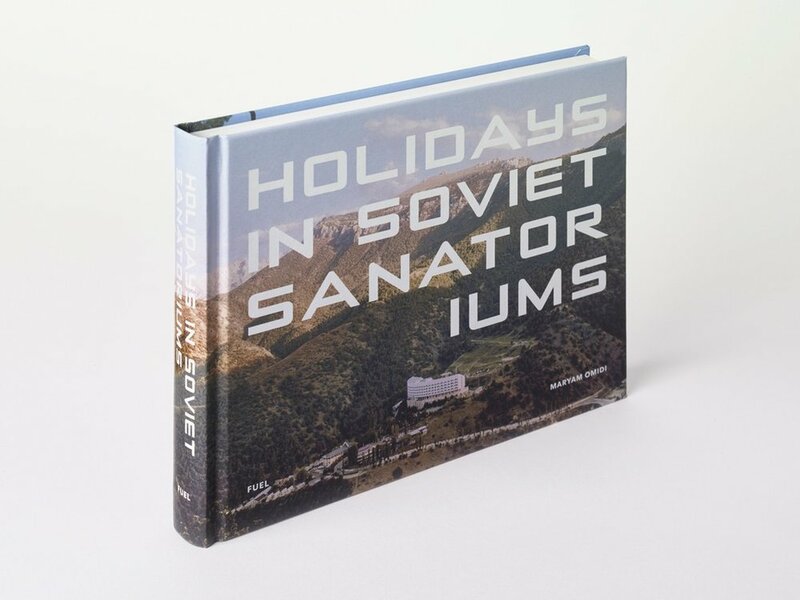 Holidays in Soviet Sanatoriums, from FUEL Publishing (whose other Soviet-themed design books include Russian Criminal Tattoo Encyclopedia and the wonderfully deadpan Soviet Bus Stops), contrasts the stark, often brutalist architecture of its featured buildings with more intimate photos of guests undergoing treatments ranging from the inarguably curative (swimming, massage) to the highly dubious (electromagnetic/ultraviolet radiation, crude oil baths). Aurora, Kyrgyzstan. Photo by Michal Solarski. The photos lovingly detail the fading pastel glory of these once-bustling institutions, and in its quiet, odd portraits of guests and workers alike at the featured institutions, the book serves as a more human counterpoint to other recent entries on Soviet architecture: Fuel's own Soviet Bus Stops, Taschen’s CCCP/Cosmic Communist Constructions Photographed (which features one of this book’s sanatoriums, Crimea’s Druzhba, on its cover), and Phaidon’s This Brutal World. National Speleotherapy Clinic, Belarus. Photo by Egor Rogalev. 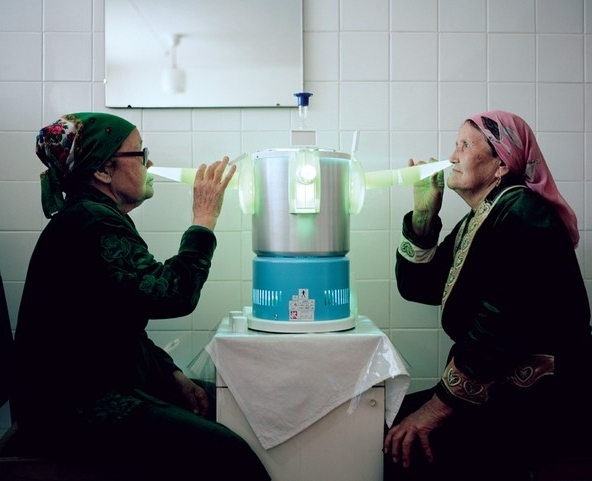 Ultimately, despite the weight of history borne by some of these locations, many of the photos of individuals quietly waiting out their treatments (often submerged in tanks or hooked up to inscrutable devices) retain a gentle quality, with some approaching impressive levels of surrealist whimsy. The book's greatest achievement is its portrayal of the intimate microcosm of personal healing, a space that lies apart from both history and nostalgia.